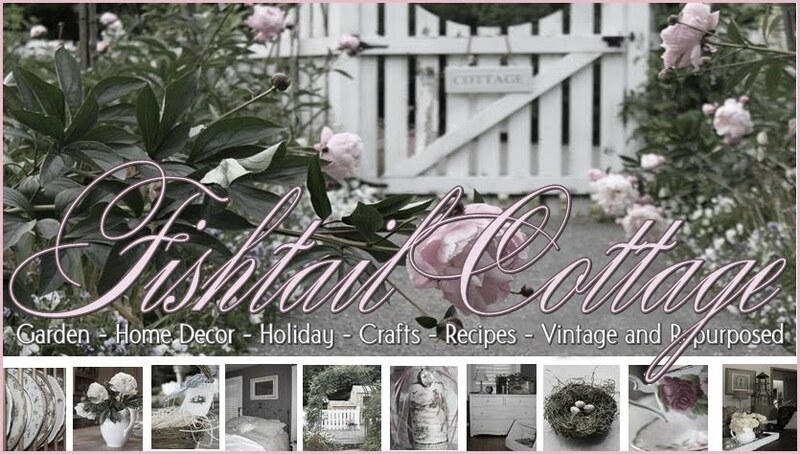 Fishtail Cottage: Cottage Flora Thursday's #2 "
This is my fourth summer in our home and I always get really excited this time of year & wonder what the garden will look like. I started out with a blank slate here & have planted everything here with my own two hands. Lot’s of digging, pulling weeds, moving & tearing out plants that aren’t working, dividing & reseeding. I know that Cottage Gardening will always be a “work in progress”, but the rewards I find the efforts of my gardening ways are so self satisfying. This is such a difficult time of year for me to stay busy as I get so anxious to get out in the dirt. However it is just frozen dirt I see. Not much too see in the Fishtail Cottage Garden right now, but I know what is coming! I was tickled to see some “spring” peeking out of the ground this week and wanted to share it with you! Showing you what they look like now & what they will look like soon! Here is a Crocus bulb peeking out. Thus far, I have planted a few bag of these bulbs every fall since I’ve lived here. They peek their heads up about this time of year & are one of the first bulbs to bloom in my Cottage Garden – the will naturalize themselves & are so pretty from my kitchen windows! Shirley Tulips are just one of the many tulips I have planted in the garden. I particularly love this one because it comes up white and changes to pink as it ages. So beautiful. This is one of my many Hydrangea’s I have planted. This particular hydrangea blooms on both old and new wood. Flowers virtually all season long and is hardy to zone 4. Endless Summer will produce magnificent pink to grape to blue blooms depending on the pH of your soil. Alkaline - pH 6-7 will produce pink blooms. Acidic soil - pH 5-5.8 will produce blue ones. For blue add aluminum sulfate to the soil. Sun to part shade. Bloom colors are pink to med. blue. Blooms repeatedly all summer…. 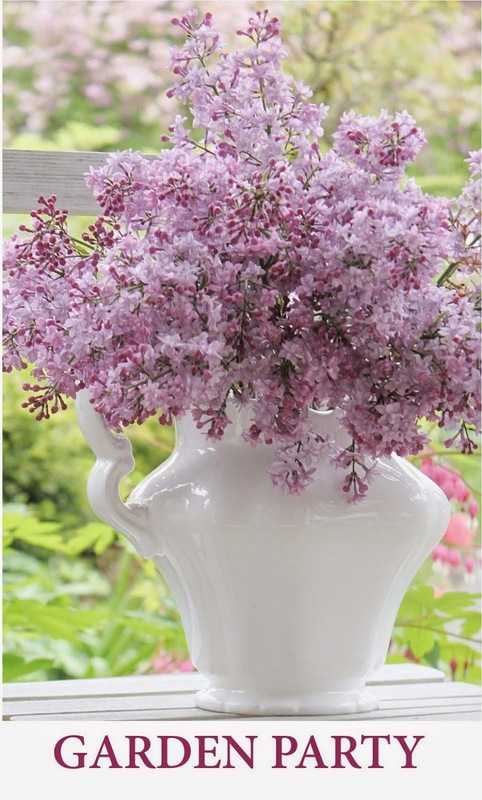 Hope you enjoyed viewing my post for Cottage Flora Thursday’s…now I’m hoping you’ll link your post too! & don’t forget to come back next week! Oh, goodness. I have zero coming up right now and if I did, it is covered in snow! I love your Johnny Jump ups...are they also called pansies...I plant them in the spring and fall because they can do well in cold, but they don't re~seed. I am hoping to join your party, but it will be awhile. I am a follower and will love to see what you and everyone else has! The green birdcage wall mount has my heart! I am going to try and make some I will have to work long and hard on one to see how it turns out. I also love how the cage hangs on the wall for all to enjoy! yes if I were a bird that would truly be my perfect home. Love your beauty over here and taking it all in. Hi Tracie, love all your little shoots coming up out of their winter's nap!... Johnny~Jump~Ups are one of my all time favorites... my mama always had those in our cottage garden everywhere when I was a little girl and now I do too...I am like you and just cannot wait to get my hands down in the dirt! I can't wait for the snow to melt so I can see what is underneath, waiting for me!... somehow, I linked twice and it spelled my blog name wrong, but I think it still links to my post, it is up... thanks for hosting this fun party!... xoxo Julie Marie PS Your little surprise went in the mail today! Hi Tracie, Thank you for the sweet invitation. Our johny jump also self-seeded uncontrolable in the garden through out the year. It save me the effort to sow them, I will just transplant them where I plan too. They make a nice border. We have temperate/mediteranean climate here. Hi, I've linked my 'drought tolerant cottage garden' post to Flora Thursday! I love your peony; now that I've moved to a colder climate, I am going to try them out. btw, I tried to add the Flora picture to my blog sidebar but couldn't do it, so I added a link to the post instead. What a fun post! I do love to garden and this was just what I needed to get me motivated to things Spring thought! I promise....I join in next week! Hubby hasn't finished reloading my pics from our old hard drive and well, I didn't have anything I could share this week! But I am so glad I got to come by and see all of your flowers! Peonies are some of my faves! We also have pansies and johnny jump-ups springing up in unexpected places! I have always considered pansies to be my favorite flower...I like their smiling little faces and the length of time we get to have them in the garden. Johnny Jump-ups too! You have some lovely flowers in the garden...I just love the Shirley tulips...I have never tried tulips because here we have to refrigerate them and that's a hassle. Some of my bulbs are already showing up...I see them poking out. I got your invitation and I will join you with my garden next week! How I wish I had a green thumb. My thumb only knows how to dial the landscaper on my blackberry! I do have an amaryllis bulb that I'm trying to convince to bloom again. I am captivated and so excited to discover your blog from Brenda's Welcome Wagon. I planted the Sarah Bernhardt Peony summer before last (09) and it came up - no flowers and last year it came up and still no flowers. I will see this year and if nothing then I'm gonna move it. It gets plenty of sun but has other plants around it that and they may be too shady. Anyway it it so good to see the new growth in your yard. I have some coming up too. I am your newest follower and will be back to join in your weekly meme. Finally, a garden linky party! I'll have to wait till May to join, but I'll keep it in mind, sweetie. I love a garden party. I have 2' of snow on my garden right now :( But I really did need a little break from it, and I know my plants are probably happy to have a break too. I love my Sarah Bernharts. (I have 10 bushes) They dry so awesome here in my ultra-dry Idaho air. So I grow as many as I can for projects all year long. I just found you through Brenda's blog and it is always fun to meet another gardener. I envy your ability to grow peonys it doesn't get cool enough here and they are so very beautiful. I linked up to Cottage Floral Thursday. Thank you! BTW, I've been taking a photo a day of my DH's gift to me..and gorgeous potted Amaryllis. It's a fun photo project that has been three weeks in the making. I've always wanted to do this! I hope you enjoy the photos. There's just something about those buds breaking through the earth that really brightens our days doesn't it? I adore Johnny Jump Ups and am so happy that Brenda sent me over to welcome you. I am your newest follower and will be back to visit you often. I hope you will stop by to see me too. hey! its me again! lol....thanks for linking in...maybe one day we can chat a little and perhaps collaborate on this party thing...that way people can link in to both parties? I love the photos with the flower just appearing out of the soil and then the flower in bloom. Wonderful. Love the peony shot, they are one of my favorite spring bloomers. Take care and have a great weekend. I enjoyed your before and after shots of plants. Amazing how in spring the gardens are so sparse looking and by summer are lush and full. The gate to hour house is gorgeous. Great pictures, I love the idea of showing the beginnings and then the final product! I am very much looking forward to Spring! I have been a follower for a while now ,I will now try to work out how to post the link to my sidebar hmmmm!